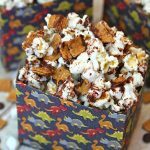 S’mores popcorn – Who knew combining popcorn, chocolate, and Golden Grahams would taste so good?! Spread popcorn out on cookie sheet. Sprinkle marshmallows, chocolate chips, and graham crackers over popcorn. Don’t worry about the chocolate chips falling under the popcorn. Bake for 5-7 minutes or until marshmallows start to bubble up. Remove from oven and stir popcorn mixture until popcorn is coated with chocolate and melted marshmallow.